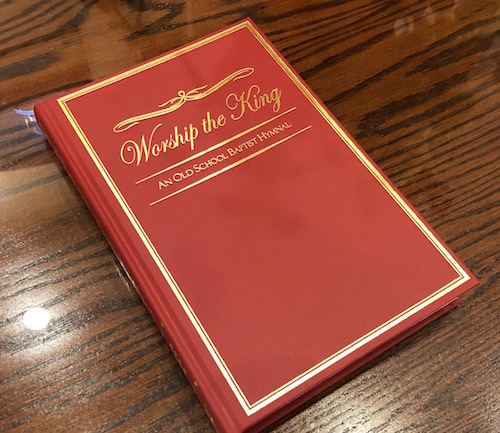 A new hymnal “Worship the King, An Old School Baptist Hymnal” is available for purchase at www.wtkhymnal.org. The hymnal was compiled by the Worship the King Hymnal Corporation, a non-profit company. It contains 450 hymns, with every word carefully looked over for Biblical soundness, and every note for worship suitability. It features a crimson cloth cover with gold leaf, pure white pages, crisp black ink and bold font for the lyrics. The book is 6″ wide, 9″ high and 1″ thick. For pricing, hymn list with audio and orders please visit www.wtkhymnal.org. Credit card or check payments are accepted.